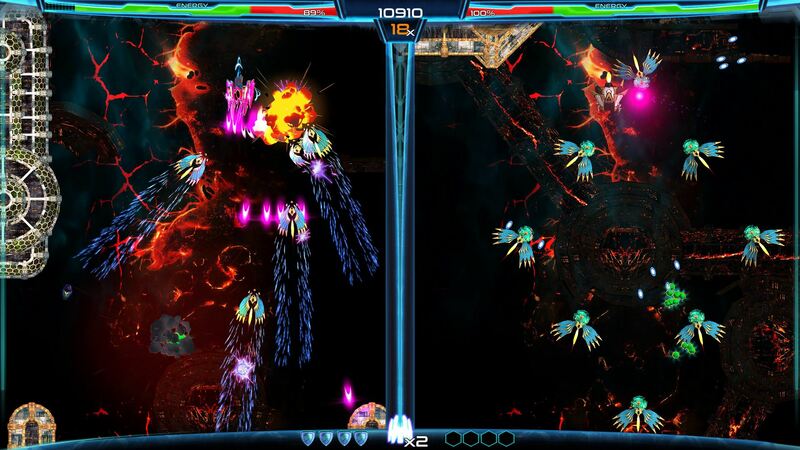 2 Screens, 1 SHMUP: ‘Dimension Drive’ Exiting Early Access for Switch Launch… Soon! As some of you may recall, Dimension Drive blasted into Early Access approximately nine months ago, complete with screen jumping SHMUP shenanigans and other fun stuff. Oh, and when players weren’t busy leaping between screens – a rather frequent event – they went out of their way to collect data cubes, unlocking additional stuff in the process. Additional groovy stuff, by the looks of it! But first things first: the two screens. Not gonna lie, it sounds a tad bonkers at first glance, trying to manage two playable areas at the same time, warping from one to the other in the blink of an eye. There’s plenty reason to do just that however, including, oh I don’t know, to avoid fatal collisions? Or to grab those aforementioned cubes, as these… grant you access to additional weapons! More guns! More missiles! More explosions! YEAH! Right. Anyway, with four difficulty modes, co-operative multiplayer in which everything is shared (oh boy…), mirrored New Game+ and a grand total of thirteen levels, I’d say there’s fun for a while in this SHMUP. Bullets will fill the screen, alongside death and decay. You won’t hear the screams of your enemies are they’re blasted to smithereens, but the sound of your own as your co-op buddy grabs the last life – now that’ll be heard for miles. Even so, you’ll gladly return to fight the good fight once more. Maybe even carry your team to victory this time. Or… just go at it by your lonesome, no one to blame should it all fall apart. Although that does also mean you get all the glory if victorious. Ya know, just saying. Dimension Drive will be available on Steam and Switch, come December 7, carrying a $12.99 price tag.